From the town of Cortez, CO, head east on US 160 for 7 miles and then you'll want to turn south into the Mesa Verde National Park (on US 10). You take this all the way into the park where you can explore many different roads ... approximate length of the trip is 30 miles or so. The road surface from Cortez to the park (8 miles)is smooth all the way with nice scenery. Then upon entering the park there is a 20 mile climb on smooth surface all the way with lots of great curves to maneuver..
Cortez has many good restaurants and there is food up within the park. Since it is only about a sixty mile round trip gas should not be an issue. Very Nice ride. Rode this in July 2012. It was very hot and the amenities are few and far between. The Park Rangers don't joke either. Passing on a double yellow line is highly frowned upon. Although it was only an $50 fine. He did proceed to tell me if it wasn't paid in 21 Days,they'd issue a warrant for my arrest. Early summer or fall is the best time to avoid crowds. A really great ride! Amazing views and great roads. Lots of traffic while I was there but that's to be expected in any national park. THE RIDE THRU MESA VERDE IS NICE, CURVY, GOOD ROAD. TAKE TIME TO VISIT THE CLIFF DWELLINGS, EVERY YEAR THE PARK SERVICE RESTRICTS MORE AND MORE OF THE ACCESS THRU OR TO THE RUINS. THEY ARE TALKING OF CLOSING OFF MANY IN ORDER TO PRESERVE AND PROTAECT THE RUINS. on August 27, 2008 0 out of 0 members found this review useful. We made the trip in late July (East-West). The lower elevations were very warm but the roads were great on a motorcycle. 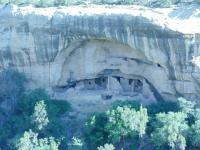 Mesa Verde was interesting and tourist friendly. If heading West out of Cortez, recommend leaving early as rooms are not plentiful in Kayenta, AR.